Represent your favorite brand before knocking down a big putt with the Metal-Stamped Ball Markers. This four pack features two markers authentically embossed with the Callaway® logo, and two markers authentically embossed with the CHEVRON mark. These color contrasting metal markers are easily visible and long lasting. Each measuring 1" in diameter, the Callaway® Metal-Stamped Ball Marker 4 Pack is a great addition to any pre-putt routine. 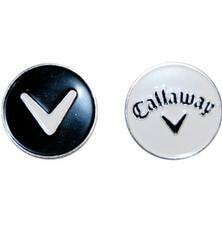 If you have any more questions about the Callaway Golf Metal Ball Markers - (Metal Stamped 4 Pack); do not see the model you are looking for; need custom options; or prefer to not purchase online, then please call us at (630) 656-1291.